Recently I was rereading for the umpteenth time Home Cooking by Laurie Colwin and its sequel, More Home Cooking. In her inimitable style, Colwin describes her amazement at the moment that she realized that her husband was indeed a European: she found him eating paper-thin pancakes smeared with jam instead of butter and syrup as Americans do. She devotes a chapter to her decision to make jam, and decides upon plum jam due to it being more difficult to purchase in a store. She made it seem so easy, which is one of her special talents, taking a recipe which to the normal home cook would seem daunting if not impossible and make it seem like something we can successfully take on. Then and there I decided I would make jam. Even though my mom never made jam or jelly or “canned” anything, I grew up with these homemade items. We were regularly given things by friends and family members like strawberry jam, fig preserves, and other items that had been magically cooked in a normal pot in a normal home kitchen and then sealed in a jar so that it could sit on a pantry shelf for an indefinite period of time. Fig preserves is one of my favorites. When I married, my husband’s godmother started sending us jars of her preserves at the holidays, accompanied by some of her famous Italian cookies. Once she sent us a jar of pear preserves and it was unlike anything I had ever tasted before—delicious. I approached this project much like I do anything that I am attempting for the first time: extensive Googling and research via my own considerable library. First I reread Colwin’s chapter on plum jam. Knowing that canning jars were either “Mason” or “Ball” brand, I checked their websites for information. I spent quite a bit of time on Pinterest and found new links to explore, including several YouTube videos that indeed made it seem doable. During this exploratory period, I happened upon an episode of the Food Network television show The Barefoot Contessa. This particular episode featured Ina Garten making orange marmalade. My decision was made. 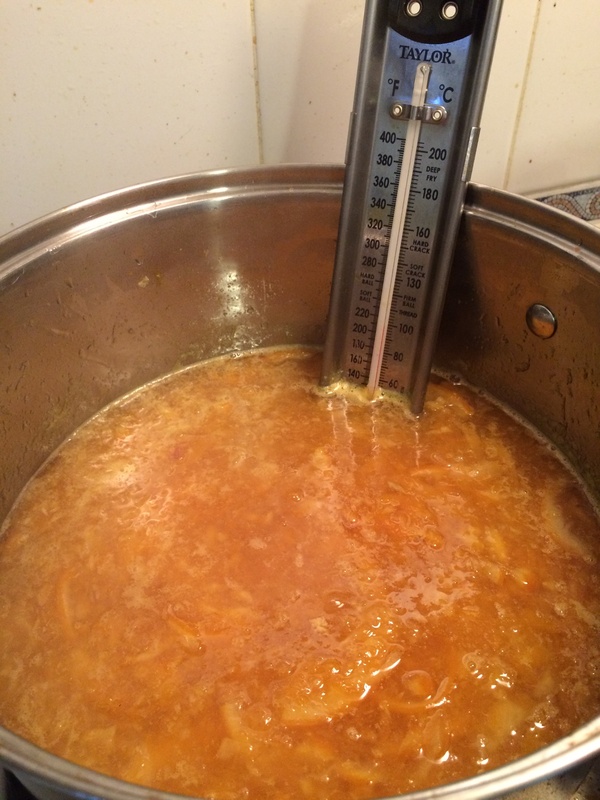 I would begin with Garten’s recipe for orange marmalade. It gave exact measurements and time frames, which unlike Colwin’s (as with most of her “recipes”), was really a well-told story about how to make plum jam. My husband, the family grocery shopper, or “logistics officer” as he once called himself, picked up the short list of ingredients: sugar, four navel oranges, and two lemons. He also managed to find a dozen half-pint canning jars on sale at our local grocery store. From my research I knew that I would need canning supplies such as a jar lifter, a canning pot, tongs, and a funnel. So I called some of my more domestic-oriented friends to see if I could borrow these items for the weekend. Finally, I had everything I needed, my Googling had sufficiently given me the courage I needed, and I was ready to begin. That’s when I realized that this recipe was a two-parter. I guess in my excitement when watching the episode I didn’t realize that the sliced oranges and lemons had to soak overnight in a water and sugar bath. This was embarrassing, a rookie mistake. Always read the recipe all the way through before beginning! The next day, with my oranges and lemons having spent the requisite time in the simple syrup mixture, I read the recipe again and started the process of jam-making, or in this case, marmalade-making. Apparently the difference between marmalade and jam is the inclusion of both the rinds and the flesh of the fruit, which means that all marmalade is made from citrus fruits. 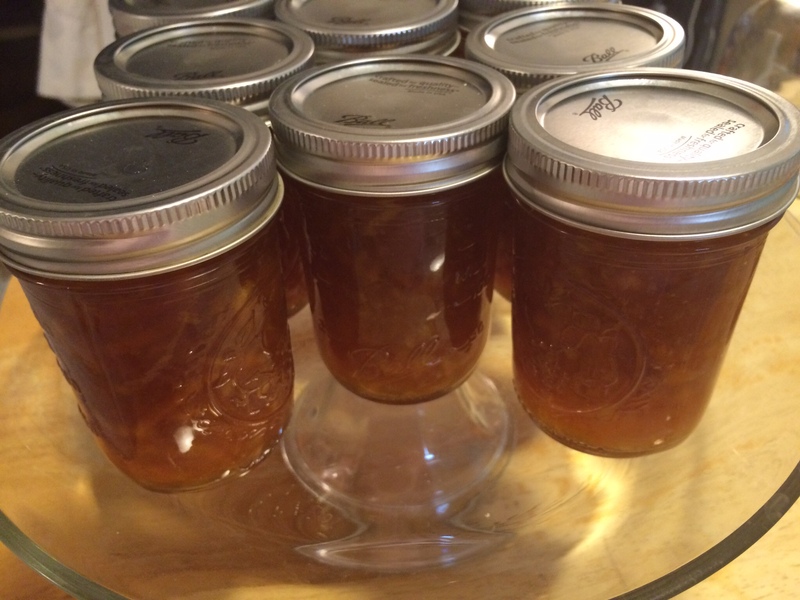 Because Garten’s recipe does not call for pectin, this process was quite time-consuming. The cooking process took about three hours but finally, the “jam temperature” had been reached and when dropping a bit of the marmalade mixture onto a saucer that had been placed in the freezer for a while, it puddled up in a little glob when pushed with my finger. Then the scary part began. For the safe preservation of foods, everything that comes into contact with the food must be completely sterile and then the sealed jars have to be “processed” for the prescribed amount of time. I tried not to think about the possibilities of screwing this up and bringing botulism upon my loved ones, but since preserving foods has been dated back to the ancient Greeks and Romans, I plowed on. Using my largest pasta pot with the insert, I placed the half-pint jars in boiling water for ten minutes, along with the rings. The lids with their little rings of sealing compound were washed with warm soapy water and then placed in a small pot with very hot but not boiling water. 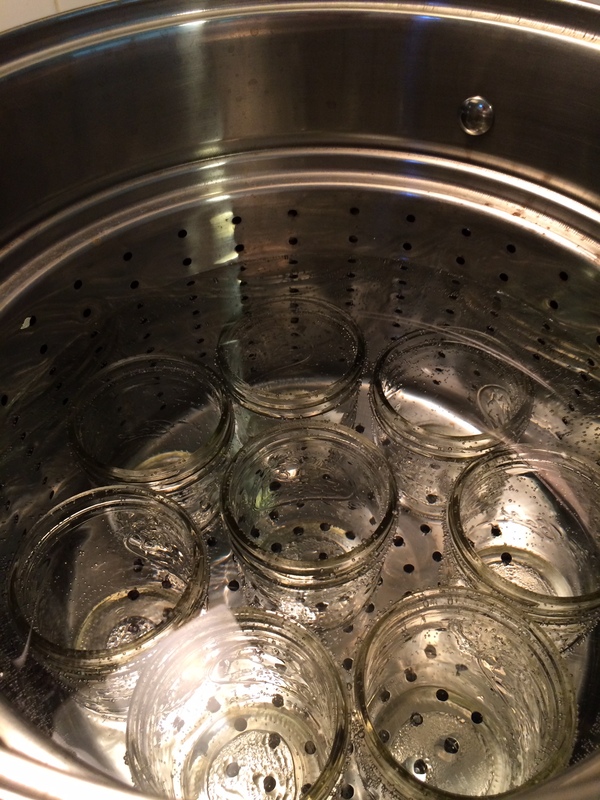 I removed the sterilized jars one at a time with the jar lifter (a miraculous device which actually does what it claims to do and is quite indispensable to jam-making). Using the funnel I filled each jar to the top leaving a half-inch of head space as stated in the recipes. Then, on goes the lid and the ring. Finally each jar is placed back into the boiling water for ten minutes. The jars are removed and set aside to cool. That’s when you step back and wait…for the magic ping. As the jars cool, a vacuum forms inside the jars and the lid, which had raised slightly in the center while being processed, becomes concave and makes a pinging sound as it snaps into place. That sound means you have successfully preserved your jam! As thrilling as hearing the ping was, cracking open a jar of it several days later and spreading it on a toasted English muffin was astonishing. I had made orange marmalade on my own. And, it was good. Really good. Passing out jars of my hard work was equally amazing. 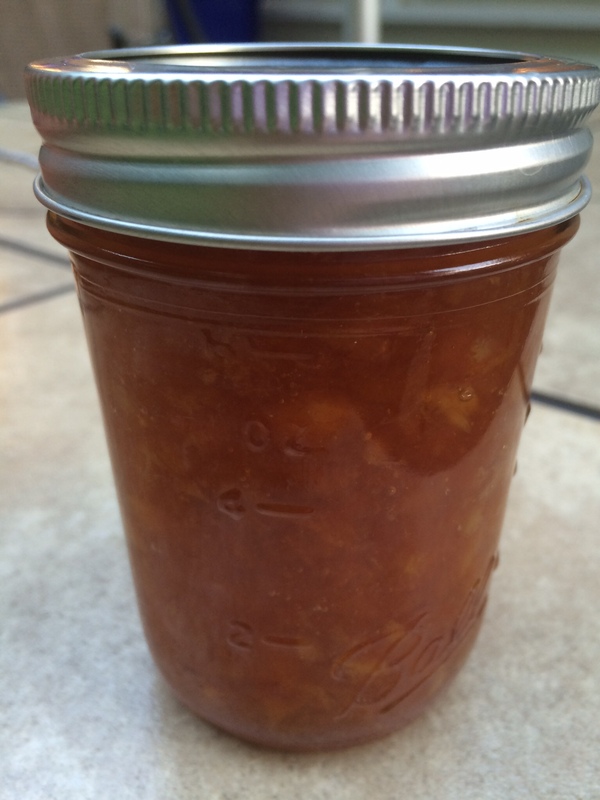 When returning the canning supplies to my friend, I bestowed upon her a jar of orange marmalade and a jar of grapefruit ginger marmalade, a slight variation of the Ina Garten recipe using grapefruits and crystalized ginger. A few weeks later, I ordered my own set of canning supplies and then tackled strawberry preserves and strawberry-balsamic-black pepper preserves. 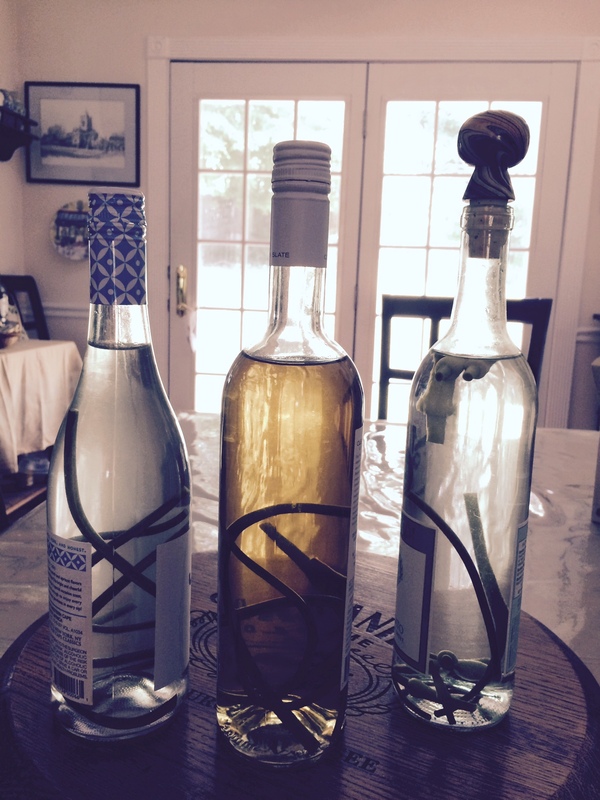 When given a bag of garlic scapes, I made garlic scape-flavored vinegar, both white wine and apple cider varieties. 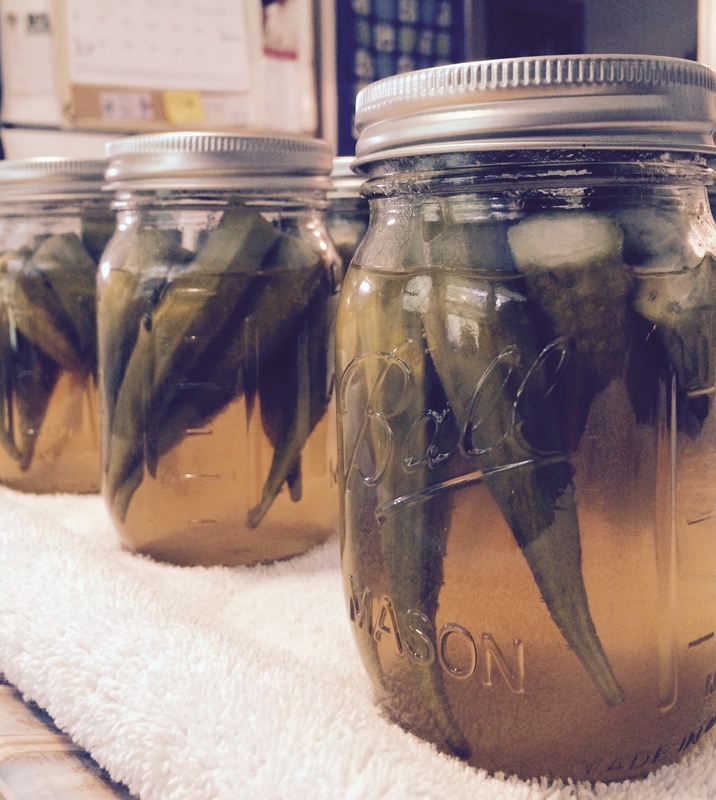 Two weeks ago, thanks to my older daughter’s shopping spree at a farmer’s market in Pittsburgh, I pickled five quart jars of okra, something that any transplanted Southerner would love to get their hands on! Jam-making, as both Laurie Colwin and Ina Garten pointed out, is very satisfying. First of all, you know exactly what is inside that jar of jam or jelly as you spread it on your breakfast toast (or your pancakes if you are European). You can control the amount of sugar or use a sugar substitute if you are so inclined. You can create jam or jelly or marmalade out of any fruit that you can find at your local grocery store or farmer’s market. And, the bragging rights that go along with those pretty jars of jewel-colored yumminess are out of this world! Colwin, Laurie. Home Cooking. New York: Knopf, 1988. Print. Colwin, Laurie. More Home Cooking: A Writer Returns to the Kitchen. New York: HarperCollins, 1993. Print. Garten, Ina. “Anna’s Orange Marmalade.” Barefoot Contessa. Barefoot Contessa, n.d. Web. 18 July 2015. “Historical Origins of Food Preservation.” National Center for Home Food Preservation. University of Georgia, n.d. Web. 18 July 2015. I really enjoy reading your stories. Now I have a craving for some homemade jam or jelly. Think I will head to Anita Springs market. Thanks Gaynell! I really enjoyed learning to make jam!! !